COME TE NUSSUNO MAI translates from Italian to "like you anyone ever" or one's first experiences in life are unique solely to you, never having been experienced by anyone in history. 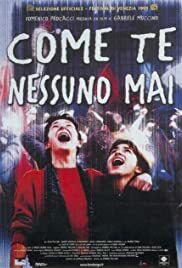 BUT FOREVER IN MY MIND is simply a quote lifted from this film about the agonies and ecstasies of adolescence and to fully appreciate the story from the adolescent aspect, the Italian title is far more appropriate. As written by brothers Gabriele and Silvio Muccino (also Gabriele directs and Silvio stars) this radiant little film covers a day in the lives of Italian highschool kids caught up in a youthful rebellion against their school's policies while at the same time sorting out the nascent changes in their burgeoning sexuality. The boys languish over their expected, anxiously awaited first physical encounter while the girls (at times on split screen just to make the comparison more strongly) relate their feelings about first time encounters with the boys. The two stories run parallel: student riots involve the police and of course eventually their parents, the two sources of authority the kids naturally challenge, and the taste of honey one of the boys achieves which becomes a gossiped, bloated misdirected moment of braggadocio that eventually leads to the serendipitous beautifully innocent discovery of teenage love.